The 2018-19 Lennard Longhorns Basketball Team: front, left to right, David Flannery, Caleb Daymond, Jayden Lacey, Rae-Shaun Wilson, Nick Davis, Coltin Peterson, and Aaron Jensen. Standing, left to right, assistant coach Courtney Ruffin, Brandon Flannery, Maurice Pickett, Donato Blue, Malik Chacon, Casey Johnson, Jalen King, Trey’von Whitehead, and head coach Zarko Stojakovic. 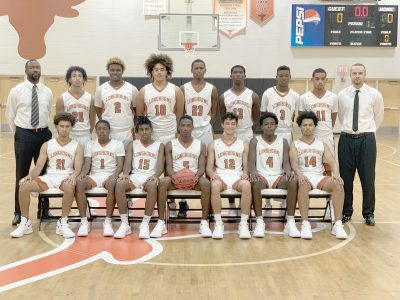 RUSKIN— Revenge and improvement are on the minds of the Lennard Longhorns boys’ basketball team and head coach as they open regular season play this week after splitting two pre-season games. 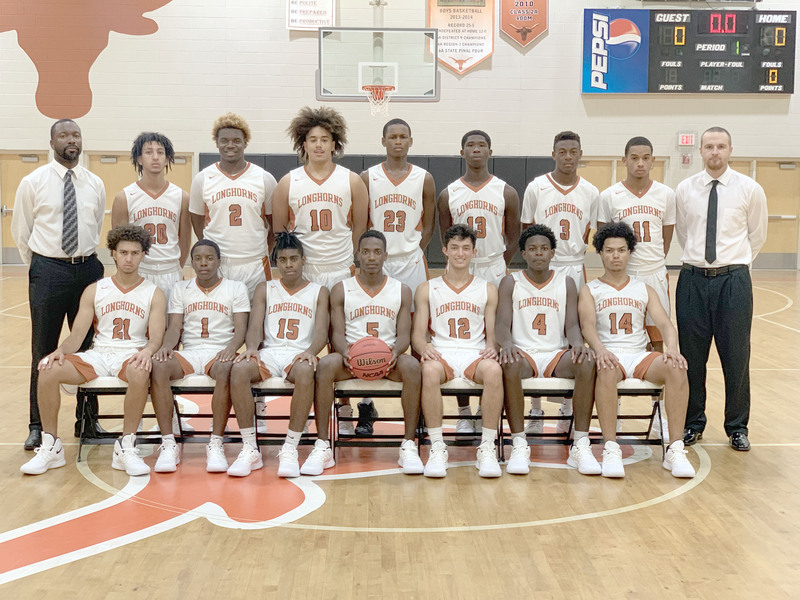 The Longhorns started play for real at Durant on Nov. 27 after losing to Lakewood Ranch and beating Bradenton Christian in exhibition games over the Thanksgiving break. Later this week, coach Zarko Stojakovic opens at home against Spoto at 6:30 p.m. Friday night, Nov. 30. Last season the Longhorns topped Spoto in overtime 62-59. In 2017-18 Lennard fell twice to Durant by a grand total of 3 points. The Cougars finished 8-13 under coach Nate Francis who has been replaced by new coach Sean Hayes. Stojakovic, commencing his second year at Lennard as varsity head coach, is in his sixth year coaching high school basketball. Stojakovich posted a 7-15 record at Lennard last season. He played at Armwood High and attended University of South Florida prior to starting his coaching career as a varsity assistant coach at Armwood for three seasons. Stojakovic also teaches Health & Physical Education at Lennard. Looking forward to this season with optimism, Stojakovic said, “I expect our team to have its best year since the final four run in 2014 (Lennard was 25-5 in 2013-2014). Although not blessed with an abundance of height, Stojakovic looks to overcome that deficit in other ways. Other than holiday tournament play, the season schedule for the Longhorns in 8A District 9 includes Hillsborough County rivals Durant, Bloomingdale, Strawberry Crest, East Bay, Plant City and Tampa Bay Tech. Among the 15 Longhorns on the varsity roster, Stojakovic is looking for stability and experience from Rae’Shaun Wilson and Aaron Jensen, both seniors, and Jayden Lacey and C.J. Peterson, a pair of juniors. Among his best new prospects are senior Calen Daymond and juniors Trey’von Whitehead and Jalen King.